Clearly, sanctions can satisfy various political, economic, military and strategic goals, but could they ever be morally justified? While the U.S.-instigated Western economic sanctions directed at Russia are in many ways peculiar, the standard reasoning applies when we consider their normative status. In every case, at the time of initial implementation of sanctions, whether they are unilateral or with U.N. blessing, strong moralistic language is employed to produce the semblance of justification. Clearly, sanctions can satisfy various political, economic, military and strategic goals, but could they ever be morally justified? Sanctions, particularly when they are comprehensive and thoroughly enforced, embodying the quarantining of a nation, may properly be seen as a form of siege, and thus an act of war. Such were, for example, the sanctions leveled against Yugoslavia in the 1990s. UN Security Council Resolution 757 of 30 May 1992 had imposed a universal, binding blockage on all trade, international financial transactions, and all scientific, cultural and sports exchanges. It will be difficult to find moral justification for placing an entire nation in such a predicament. The case of Russia is different, but some of the same arguments apply; in particular the aspect of international economic sanctions that involves continuous escalation of demands on the targeted country. While this practice is an element of the very nature of the exercise of sanctioning countries this, at the same time, makes unavailable any moral justification for keeping sanctions in place. Economic sanctions are envisaged as a sort of punishment, based on what should be an institutional decision not unlike a court ruling. Hence, the conditions for their lifting should be clearly stated and once those are met sanctions should be lifted. But this is generally not what happens, and perhaps is precluded by the very nature of international sanctioning. As a result of this logic of escalation, economic sanctions cannot be properly articulated in any law-like system. Economic sanctions have much more in common with war than legal punishment, and in fact represent a form of siege. As such, they cannot be ended simply on the basis of their initial rationale, for the very process of sanctions implementation opens up possibilities for setting new goals and a continuous redefinition of the goal that sanctions are seen to have. Normatively speaking, the lifting of sanctions should occur as soon as designated goals are achieved, but what may be put forward as a goal in this sort of case? Clearly, only something which is perceived as achievable. This is a matter of rationality, for if the demand is issued for more than can be achieved, the credibility of the sanctioning side diminishes, which puts in question concessions that might have otherwise been obtainable. Effectiveness of the outcome is of crucial importance. The outcome is precisely what confirms the power and authority to issue a demand for anything in the first place. Without this power, we would be dealing with something entirely different, such as wishes, desires, visions, descriptions of ideals, interpretations of the way things ought to be, and so on. Yet there would be no sanctions. It is a matter of rationality that this power will make demands focused on the maximum it perceives as obtainable at a time. This is what underlies the fact that, once implemented, sanctions exhibit continuously changing conditions for lifting them. Thus, the constant amendments of the conditions required for lifting the sanctions are not due to initial deceitfulness or hypocrisy on the part of the sanctioner. Rather, the policy shifts that accompany the imposition of sanctions should be seen as a consequence of the (perceived, even if delusional) power discrepancy, with the sanctioner having the ability to take more and more from the situation. 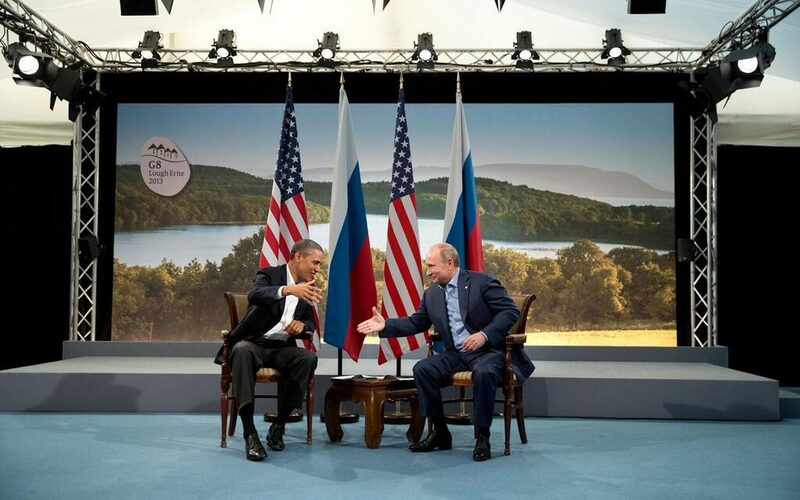 In this respect, the case of the Western sanctions against Russia is substantially different. Sanctions are a process when the satisfaction of one goal opens up the possibility for setting another that could not, until then, have been imposed as a goal. However, when the first goal is achieved, then the opportunity for some other goal generally arises. This occurs even though up until that time there is no pre-set (or already conceived) second goal, because it would have been irrational, since conditions for its satisfaction were simply not apparent. Given that such conditions inevitably present themselves, it would be utterly irrational to abstain from pursuing the new goal for it would look like giving up when one is already halfway there. It makes no difference that the point which the sanctioner has now reached was initially perceived as the end of the road: it now becomes apparent that one is just halfway there! Thus the cycle starts all over again, with the possibility that the new opportunity will present itself, the opportunity to achieve some third goal, then the fourth and so on. This continues as long as the following two conditions remain in effect: that new opportunities continuously present themselves (which will generally be the case) while the power and will to exploit those opportunities remain in the hands of the sanctioner. How long will this keep happening? This question is unanswerable in advance, for it is an empirical matter. Theoretically, opportunities will present themselves until they are all exhausted. And as long as they are not exhausted it will be irrational to abandon setting up new goals and to stop issuing new demands. For, the reason to adopt the second goal is the same that presented itself as a reason for the first goal. It would be absurd to abandon the second goal, for this would in some sense mean giving up the first goal as well. If the reason for putting forward the first goal was sufficient to adopt it as a goal, and conditions have not changed dramatically, in particular the ability to issue demands, then what was once a sufficient reason continues its influence with full force. Admittedly, once a goal has been achieved, a goal that was put forward as something which was wanted, and not simply desired, then the opportunity to really want something else (which might have earlier been simply in the domain of a mere wish) presents itself as a real possibility. And it will always turn out to be unthinkable to just give it up simply because it was not put forward as a goal at some previous time, at the time when this could not have even been entertained as a feasible goal. For this new possibility opened up only after accomplishing the first task. All the while, it may not even be known in advance what the new goal might be. This is a feature of the empirical situation: the openness and lack of certainty about the future. It is irrational not to want something which is perceived as good, achievable, and in some sense significant, simply because something else has been achieved which was at some prior occasion perceived as the sole achievable thing. And if something is desired and achievable, what is there to prevent it from happening? What principle could be applied here in order to draw the line in advance, other than the one that requires that, following the goal initially set, all opportunities that present themselves also be exhaustively pursued? This is the reason why sanctions cannot be halted once implemented, or put differently why it is much easier to set them in motion than to stop them. And since there is no internal barrier, which would be there from the outset, and no such barrier can be introduced later that was not there earlier (for example, with respect to those who are treated exploitatively or paternalistically), then there is no possibility to halt the onslaught of sanctions until all opportunities are exhausted. The conditions are just as in war: there is no end until final victory. There is no pre-established procedure or defined end point; neither of these can be expressed in legal terms, only political. This is where it becomes perfectly apparent that sanctions have much more in common with war than with some court procedure. It is only rational to press all the way to final victory, or in any case to some point, which is not the state of initially defined demands, but the state defined in terms of what is seen as the desirable end result. On the basis of this logic of escalation of demands in the process of sanctioning, a lesson can be drawn for either side. The party that is doing the sanctioning will pursue in a perfectly rational way the issuing of ever-new demands as long as it is getting something in return—that is, managing to obtain any concessions in the first place. On the other side, the sanctioned party, depending on its power, must resist any temptation to give in on any demand as doing so will only serve to unleash the sequence of escalation of demands; and secondly, again depending on its power, should immediately engage in the process of counter-sanctioning. The logic of counter-sanctioning is, of course, the same: given any opportunity for engaging in the process of escalations of the counter-demands it is perfectly rational to escalate. Russia seems to have perfectly understood the logic of escalation on both sides of the sanctions divide, and has decided to give in to no demand issued from the West while at the same time Russia engages in sophisticated and painful counter-sanctioning of the weaker component of the sanctioner’s side, the E.U., with an eye to escalation. In this situation Russia can even afford to de-escalate in the cases of well behaved and unwilling would be sanctioners like Greece or Hungary. Finally, let us ask how long can this last? This can end only with the final victory of one side or the other, like in any war. This article is based on an article coauthored with Jovan Babic, “Economic sanctions, Morality, and Escalation of Demands on Yugoslavia” International Peacekeeping 9:4, 119-126. Aleksandar Jokic is Professor of Philosophy at Portland State University.